Voters battered President Tsai Ing-wen and her independence-leaning party in local elections, despite strong economic growth. The opposition is already reaching out to Beijing. That may augur a welcome period of calmer cross-strait relations, just as trade war storms strike. Supporters of Opposition Nationalist Kuomintang Party (KMT) Kaohsiung mayoral candidate Han Kuo-yu celebrate after Han won the local elections, in Kaohsiung, Taiwan November 24, 2018. Taiwan’s ruling Democratic Progressive Party lost two key mayoral races during local elections held on Nov. 24. The DPP now only controls six cities and counties, to the opposition Kuomintang’s 15. President Tsai Ing-wen resigned as the DPP’s chairwoman in recognition of the defeat. She rejected the resignation of her premier, William Lai. Han Kuo-yu, the Kuomintang’s mayor-elect in the southern port city of Kaohsiung and the most high-profile of the party’s winners, said he would open the door to contacts with China. 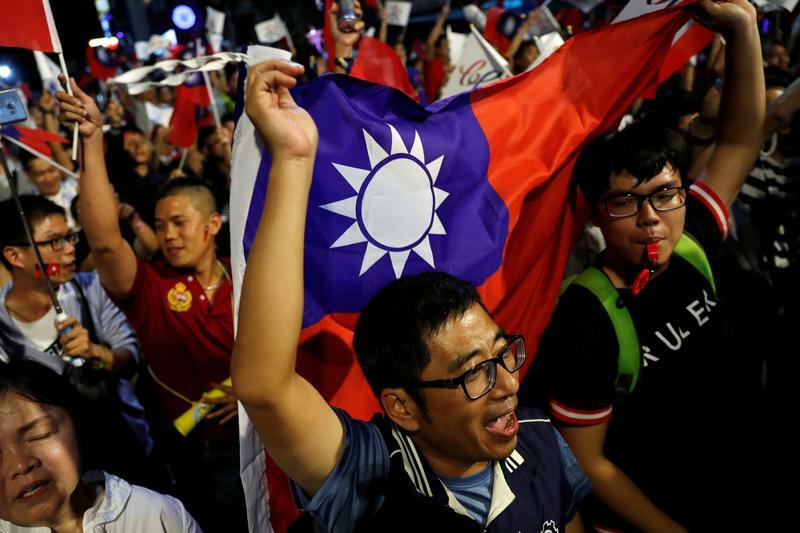 Voters rejected a proposal for the island to join the 2020 Tokyo Olympics as Taiwan, rather than “Chinese Taipei”.